Spring Roll Machine and Equipment - ANKO High Efficiency Spring Roll Production Equipment Design | ANKO FOOD MACHINE CO., LTD.
ANKO's SR-24 Spring Roll Production Line is an automatic production line that starts from battering, baking and chilling the wraps, to filling, folding and wrapping the rolls; it's capable of working with a wide range of fillings, from ground meats, shrimps, chopped vegetables and even sweet fillings such as azuki bean or taro pastes; with a uniformed product length at 100mm, and diameter from 25-30mm. The maximum capacity of SR-24 is at 2,400pcs/hr, we highly recommended it to chain restaurants, central kitchens and food factories. Spring rolls is an umbrella term used in Western culture to describe disparate varieties of filled, rolled appetizers similar to the Chinese chūn jǔan (春卷, lit. "spring roll"), from which the term was derived. East and Southeast Asian cuisine foods referred to by the term have different names depending on their country of origin, as well as the type of wrapper, fillings, and cooking techniques used. They are commonly eaten in certain Asian countries, most notably China, Vietnam, Singapore, Indonesia and Philippines. The machines listed below are designed for making Spring Roll. Please feel free to contact us via the form below. We will happy to answer any questions you may have regarding our products, services, and turnkey projects. 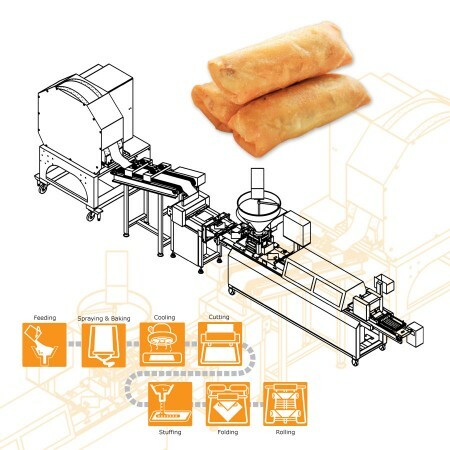 Spring roll Production Line designed by ANKO is fully automatic to produce 2,400 spring rolls in one hour. After pouring well-stirred batter and stuffing, the automatic process starts from baking drum, cooling fans, cutter with sensor to innovative depositing, folding and wrapping devices. It is the ideal solution for making identical quality and tasty spring roll that can compete with handmade spring roll. 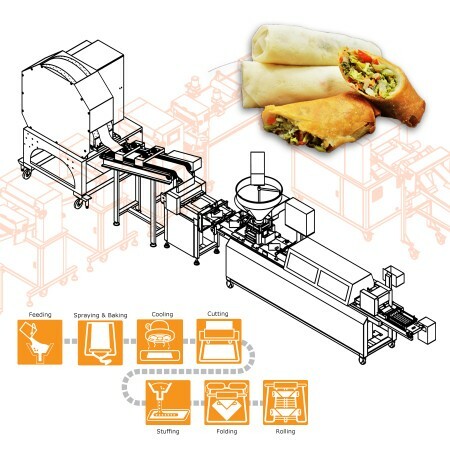 SRP is a food processing machine for automatically producing spring roll pastry, samosa pastry, egg roll pastry, and even crepe. What a user only has to do is to prepare batter. The rest of steps, including baking, cutting, counting, and stacking are done by machine. The final products are tidily and nicely stacked in piles, ready to be packed, frozen, and sold at any time.